Comment: In The Origin of Jonah Hex, we learned that Hex was raised by Apaches and raided a nearby Kiowa village. That would place his story in northern Texas or Oklahoma. The Apaches occasionally used tipis like the ones below. And they may have set up their tipis in forests rather than on the plains occasionally. But I suspect Apache tipis in a forest would be rare if not unknown. Of course, the movie could've changed Hex's origin. But even if it's set in the northern plains, you wouldn't expect to see tipis in a forest. Maybe among the Cheyenne or Arapaho in the Colorado area, but not in general. Really? Indians wearing crows' heads and loincloths? 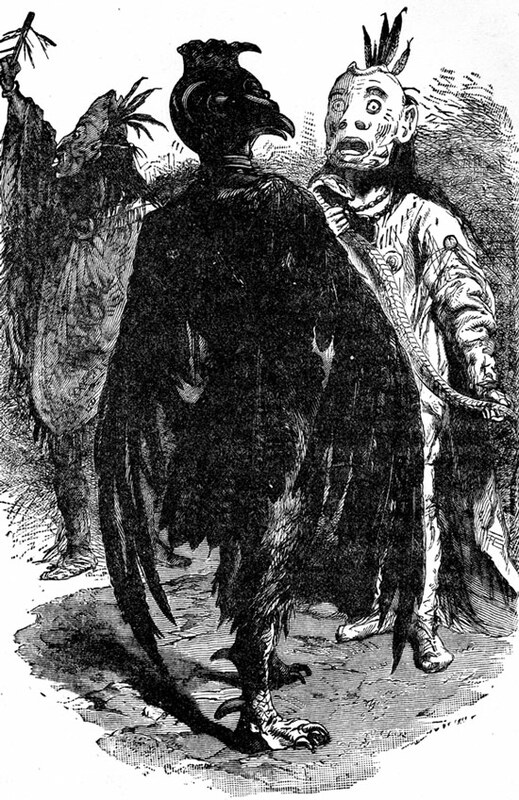 Some Indians of the Pacific Northwest wear elaborate raven costumes and masks for their ceremonial dances, but they don't look like this. I'm pretty sure I've never seen anything like these masks. I wouldn't swear that they don't exist in some culture, but if they do, they're rare. Whether they're authentic or not, they don't represent Indians well. I presume the "Medicine Man" is the masked figure on the right. The bird man has real bird's feet, so he isn't a human in disguise. Moreover, I have no idea if this drawing is authentic or even if it depicts Indians. These could be indigenous figures from another part of the world. Back to the Jonah Hex movie. I suppose its "bird men" could do a holy dance to purify Hex--to cleanse his soul of hate and anger. But I wouldn't bet on it. More likely, they do a devilish dance to prepare Hex for torture and death. Perhaps not coincidentally, the Jonah Hex listing on IMDB.com doesn't include any obvious Indian characters. I'm getting a strong impression of half-naked, generic savages who capture Hex and perform a macabre ceremony before they (try to) sacrifice him to their dark gods. Please tell me I'm wrong. I can't even tell if the four guys playing Indians are Native actors. Perhaps they're the Asian actors we heard about before. If so, ugh. For more on the subject, see Jonathan Joss on Jonah Hex and Casting in Jonah Hex.